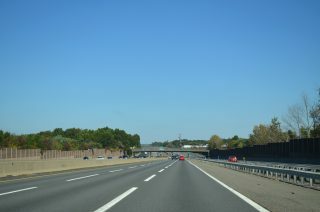 Northbound along the New Jersey Turnpike portion of Interstate 95 through East Brunswick. Photo taken 10/05/14. The NJ Turnpike partitions with two Inner Roadways (cars lanes) and two Outer Roadways (truck lanes) between Exit 6 at Mansfield and the separation into the Eastern Spur (I-95 through Secaucus) and the Western Spur (unsigned I-95W) through the Meadowlands. 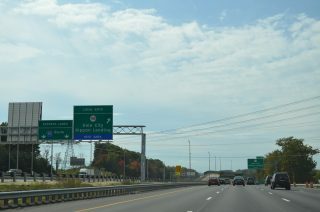 Interstate 95 southbound at the flyover linking the Express HO/T lanes with the general travel lanes ahead of the Dale City (Exit 156) off-ramp in Northern Virginia. Photo taken 10/12/14. The reversible HOV roadway running between the north and southbound mainline of Interstate 95 through Northern Virginia was reconstructed and expanded as part of a multi-year project completed in December 2014. Work extended the existing roadway nine miles southward to Garrisonville Road in Stafford County while expanding the older roadway further north by an additional lane. Tolls are charged to non-HOV3 traffic at variable rates depending upon time of day and congestion on the general purpose lanes.